Before we get to the Weapons today, I want to take some time to dish out some love to WKU. Last night Western took on Middle Tennessee for the Sun Belt Championship. After a first half that was close, WKU took control in the second half. Never really blowing them out, but they always seemed to be in control. So with that win, Converse now has 100% of their schools in the tournament. I can't think of anyone else that can say that. 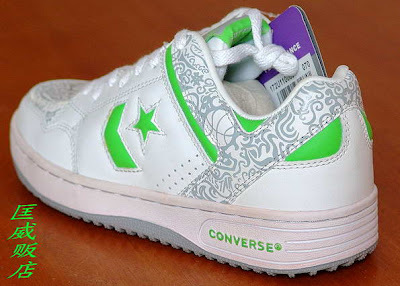 I was beginning to wonder if I was ever going to talk about Converse in the NCAA tournament again. Now thanks to WKU and Marquette, I can. Now that we've had our last good snow of the year, temps are on the rise. Well, until Tree Bark Winter, or whatever they call it these days. Anyway, the point is, bright times are coming. New life is starting to come about; our flowers are beginning to bloom, and the grass is getting greener. 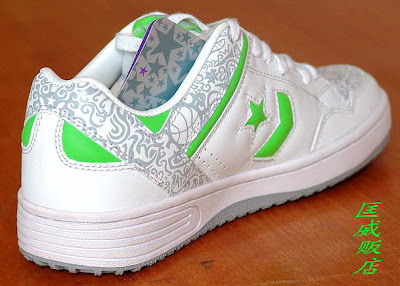 Below is a Converse Weapon from either Japan and China, I am not for sure. 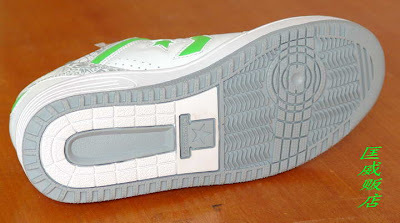 They're white/neon green/grey in colorway. 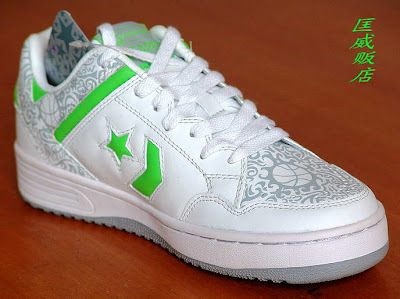 These have basketballs in the grey design pattern and have a few splashes of neon green. 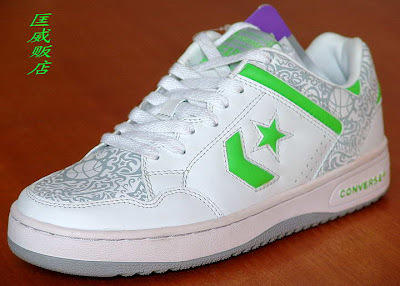 These shoes scream March, bright greens, basketball, white shoes. Enjoy! Well, that's it for today. As you've probably noticed, the poll closed and with a late push Brandon Roy moved ahead of Chris Bosh for second place. But it was really Steve Nash's show from the beginning. I couldn't agree more with the top three. Who knows, maybe the right people have seen the poll, or perhaps not, either way it was fun. I am working an equally fun and thought provoking poll to debut, possibly later on today. Thanks for reading the blog... or just looking at the pics, that's ok I forgive you.